US police used tear gas and pepper spray to disperse students and college football fans who flooded the streets of Columbus, Ohio, on Tuesday, following the Buckeyes’ National Championship win. The campus was patrolled by Ohio State and Columbus police officers, dressed in full camouflage gear, who used tear gas to break up crowds of revelers celebrating Ohio State’s 42-20 victory in the college football National Championship game, AP reported. Thousands of chanting and cheering people, who gathered at the Ohio State football stadium and local bars, poured out, blocking some streets. To disperse the unruly crowd, SWAT and riot police were deployed in an effort to clear the streets. Students were reportedly warned to clear areas around High Street or risk arrest. 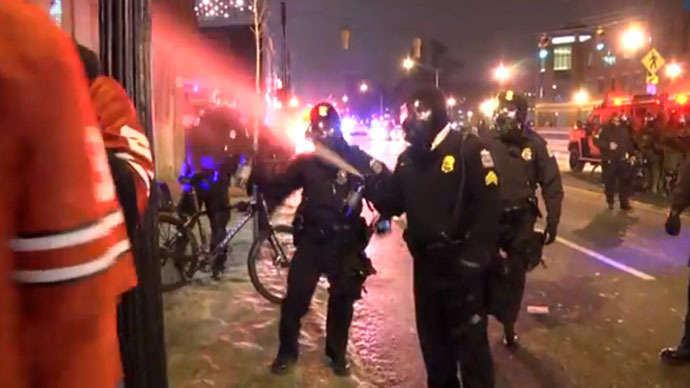 "@NBCNewsRiot cops use tear gas on Columbus crowds after Ohio State wins College Championship http://t.co/RvOnG34t6cpic.twitter.com/8IZqQsaUZ6"
The Columbus Dispatch newspaper reported about three canisters of tear gas used in front of the Ohio Union around 1:15 am. Sometime earlier, police began using pepper spray on many of the football fans. A police spokesman said there were 30 to 40 fires in trash cans and dumpsters, AP reported. There were also reports of celebratory gunfire. No serious fires or arrests were reported, however, some people left the area with stinging eyes and runny noses. One person was reported to have been transported to the hospital. The crowds began dispersing after two hours.